Mom’s need calm and focus more than most people. Frequently their lives are filled with extra stressed and responsibilities that the rest of the family takes for granted. So as you celebrate your mother this year, consider a gift to help her relax, relieve stress, meditate regularly, or level up her yoga practice. These yoga and mindfulness themed gifts are the perfect way to help inspire self-care and peacefulness for one of the most important women in your life. From gift ideas for a healthy lifestyle to straight up pampering, check out the ideas below. Jewelry is a classic gift for Mother’s Day, especially from husbands to wives. This gorgeous necklace is completely unique and unlike anything you’ll fine in a traditional jewelry store. Life Power Art makes these one of a kind, handmade tree of life necklaces. 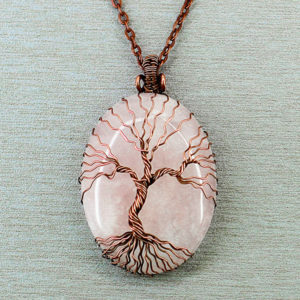 Each pendant features a beautiful stone wrapped in copper wire to create the tree. A variety of crystal and colors are available, so you can select the perfect one for your mom. One of the best accessories for relaxation is aromatherapy candles. There’s something about the glow of a candle and the benefits of the combined aromatherapy that can take “me time” or meditation time to the next level. This gift set includes soy candles in lovely decorative containers that look great on display. This set of four candles includes these scents: rose, lavender, lemon, and Mediterranean fig. Check out the best candles for meditation. One of the greatest gifts a mother can receive is the gift of time and space to focus on mindfulness and self care. These prints are the perfect decoration to create a room or corner specifically for meditation or yoga. 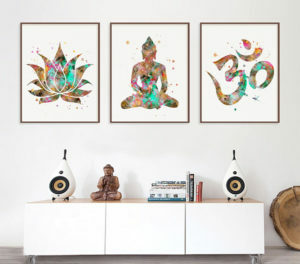 This beautiful trio of meditation art features muli-color watercolor prints of a lotus flower, meditating Buddha, and the Om symbol. Miao Miao Design offers these as prints or framed, plus they also have them available in other colors to match your home decor. This pocket-sized mindfulness tool is the perfect gift for stressed moms. The Stress Less Cards includes 50 mindfulness and meditation exercises. This is perfect to keep in a bedside table or desk drawer to grab for a quick moment of mindfulness whenever it’s needed. 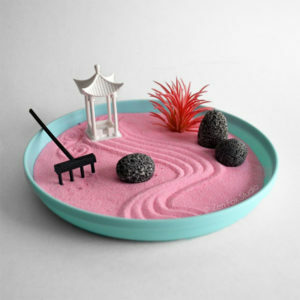 This is such a cute gift for mindful moms that are rubbing off on their kids. THis tank top set made by Sun Baked Apparel features a lovely print, one says “Yoga Mama” and the other says “Yoga Mini.” Available in a variety of mom and kid sizes, you can also customize your color since each set is made to order on 100% cotton tank tops. Yoga wheels have become very popular in recent years and make a great addition to any home yoga practice. Perfect for modifying a variety of poses including backbends, they can help enhance and deepen yoga poses. This wheel from yoga design lab is perfect to gift to mom thanks to its beautiful design. Check out more yoga props. Mother’s need “me time” to decompress and relax. This gift set is perfect to give your mom or wife an excuse to pamper herself a little. 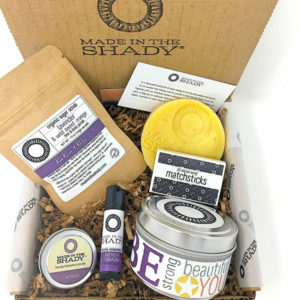 This Self Care Kit from Made in the Shady has everything they need for a pamper session. The smaller set includes soap, a body scrub, lotion bar, and lip balm, or you can upgrade to receive that plus a candle and matches. You can also select a scent pallet including lavender & citrus, lavender & mint, citrus & mint, coffee & citrus, or a mixed scent set. Personalization is available for this relaxing gift set. Your yoga loving mom probably already has a yoga mat, but do they have a really great mat or just an affordable one they picked up from Target? Get your mother the best, with this Manduka Prolite mat that is a favorite among experienced yogis and beginners. 100% latex free, these mats provide a high density cushion for a comfortable practice. The closed-cell surface repells sweat and dirt, making it easy to clean. Help mom take her practice to the next level with this gift. Check out more essential yoga gear for home practices. Now that Mom has a nice new yoga mat, she needs the perfect tote to take it to class. I love these totes from Aurorae because they’re perfectly sized for all your yoga gear and they come in beautiful patterns. The snap closure allow you to keep the bag compact or you can leave it open to store your mat, towel, gym shoes, water bottle, block, and more. Perfect for winding down or using while meditating or practicing yoga, this set of essential oils is designed for anyone who needs to de-stress. It includes three aromatherapy blends: Stress Relief, Relaxation, and Quiet Time. They come in attractive packaging perfect for gifting on Mother’s Day. Check out the best essential oils for meditation and yoga. Let your mother take relaxing aromatherapy with her everywhere. This gorgeous aromatherapy bracelet is made from genuine leather, with a rose gold locket. It comes with 8 washable and reusable felt pads to help diffuse the most relaxing scents. Perfect for aromatherapy on the go or at work. Check out the best essential oil diffusers for meditation and yoga. Mala necklaces feature 108 beads meant to be counted off as you take breaths while meditating. 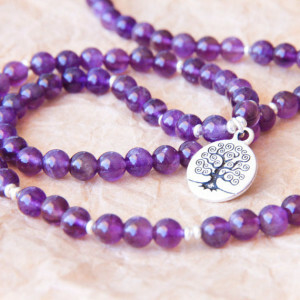 Japa malas make a perfect gift for moms who like to meditate. They are available made from a variety of materials and stones with different colors and meanings. (Learn about mala meditation necklace meanings by color.) They’re also lovely accessories to wear any time as an extra reminder to be mindful. Meditation shawls are very popular for home meditators, especially people who meditate in the morning. This shawl from Om Shanti Crafts is a lovely Mother’s Day gift, made from 100% wool so it’s soft and warm. This oversized shawl can completely wrap around the body for sitting meditation, keeping the wearer warm so they can focus on their breath. Handwoven in India, it can be worn around the house or even used during savasana to stay warm at the end of yoga practice. Check out more meditation shawls. If your mom loves to sip coffee or tea, this mug is for her! Sometimes we just need a little reminder to breathe and let go of the tension in our lives. This mug will help her remember to stay present and be mindful as she enjoys her favorite hot beverages. This 14 oz. mug comes in three colors (sky blue, pink, and brown). Need more gift ideas? 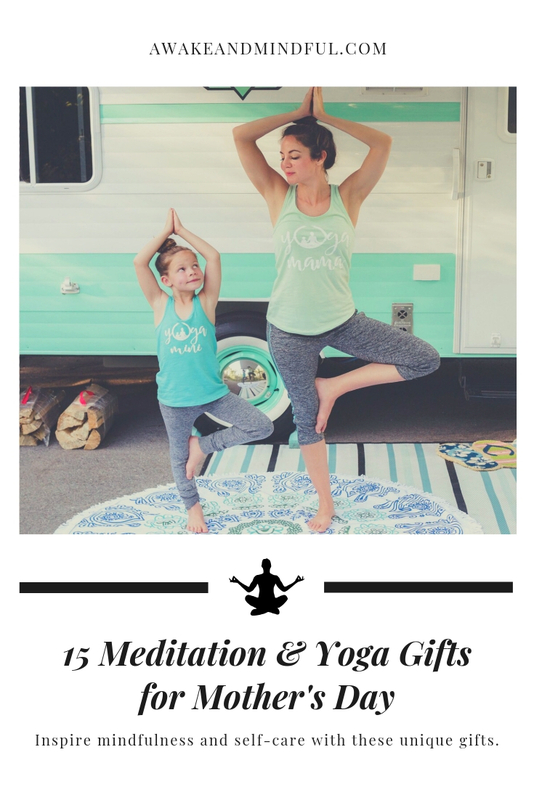 Check out our guides for yoga gifts, meditation gifts, and gifts for fitness lovers. Also explore Mother’s Day gardening gifts and gift for mom readers.